In American soccer everything is happening very fast. New team joining MLS almost every season, clubs with freshly-crafted identities pop up across the country and investors can even swallow the entrance fee reaching $150 million in the latest expansion round. LAFC is a great example of such new entity, which only arrived on the map of American football in 2014. In late January of this year they held their very first training as the team prepares for its MLS debut. LAFC will fill the void created after failed Mexican-US transplant Chivas went bust. While not as Mexican in terms of identity, LAFC is appealing to the Latin-American base of California. Some of its players are Latino, so are numerous supporters, who can use LAFC's website in Spanish, should they so wish. Also, if you take a look at stadium renderings, you'll see atmosphere comparable to that in Argentina. Well, you might say renders are one thing, but already in their first displays (in the streets for now) supporters of LAFC don't exactly refrain from large flags or pyrotechnics. There's a new level of connectivity planned for them, which might see fans literally downloading their sports betting codes live from their seats. Once they finally arrive at their new home, currently under construction beside the iconic Memorial Stadium, they'll find it taylored for high-volume atmosphere. Designed by Gensler, the stadium features a very steep single tier in the north (34º) with safe standing for 3,252 people. Covered with light ETFE skin, it should provide brilliant conditions to create support just like the one in renderings. It's worth mentioning that some people will find themselves really close to the players. Minimum distance at the stadium is announced to be just 3.7 meters (12 ft), almost hand's reach. Not just the details, but overall stadium bowl is well thought-through, allowing 22,000 people comfortably inside and providing an opening to the north-east. Through it some spectators will be able to see the skyscrapers in downtown, while corporate fans on top of the west stand will also have a swimming pool at their disposal providing a stunning view to the west. They might not exactly see the Ocean, but a nice overview of the Olympic complex and part of the 11,150 m2 of landscaping around Banc of California Stadium. Banc of California is crucial to the project not just due to naming rights, worth estimated $100 million. The institution also covered part of the $180-million loan needed to finance the stadium. Banc of California Stadium will cost a total of $350 million, no small figure for a 22,000-seater. That said, a look at the business clubs planned within the west side or the fan-consulted pub and you get an idea of where some of the money went. For the time being you might not see the luxury, so far only some of the seats are installed. 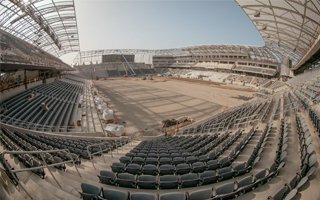 But we're here to watch the final weeks of construction with you as LAFC allowed us to use some of the official images. Opening of the stadium is planned for April 29, when one of the largest clubs in MLS, Seattle Sounders, come to California. This means construction will take roughly 1.5 years from groundbreaking (excluding demolition of the indoor arena standing here before), a very reasonable time frame!